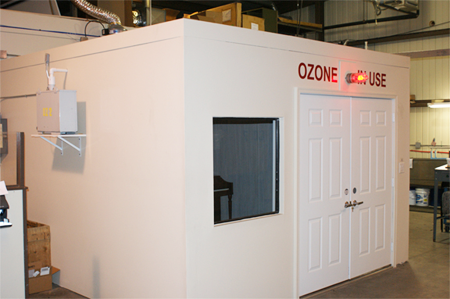 Single Source’s state-of the-art facility has an exclusive ozone chamber that works to permanently destroy serious odor. Ozone also kills bacteria and fungi and works as a sanitizing agent. Single Source’s cleaning technicians clean customer’s personal property at the same time as the structural cleaning. When issues arise, such as instability of the structure or the need for more specialized cleaning techniques, the customer’s personal property is moved and cleaned at our facility. Single Source employs proven methods to clean and restore personal property including furniture, electronics, china, dinnerware, books, photographs and most items in a home. We take great care to clean items by recommended cleaning methods to ensure items are returned to pre-loss condition. 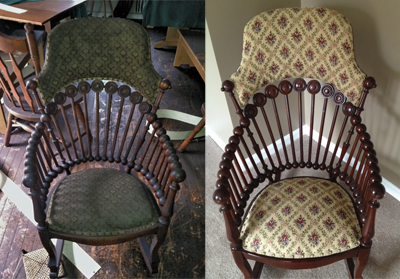 Before and After – An antique chair damaged by smoke and soot was cleaned and restored by Single Source. Technicians use many different tools in the cleaning process. Dry sponges are used for cleaning books and other paper products. Wood soap and polish is used on wood furniture. Upholstered furniture is cleaned using either a dry clean method or steam cleaning method depending on fabric specifications. Ultra-Sonic machines are used for cleaning window blinds, china, dishes, knick-knacks and even some electronics. Once the cleaning process is complete, contents are moved to an ozone chamber for additional deodorization. Ozone deodorization is extremely effective for more serious odor. This is the primary method for clothing, upholstered items, papers, books or any other porous material affected by an odor. The machine takes oxygen out of the air (O2), charges it electrically and turns it into Ozone (O3). Ozone is highly reactive and combines with malodor molecules to chemically alter their structure and rid the property of odor. Because ozone has the ability to penetrate into fabrics and surfaces to the same extent that the odor did, it is the most effective means of long-range deodorization and it is permanent. There is no residual odor from the process itself and no damage to the property. Ozone also kills bacteria and fungi and works as a sanitizing agent. It is a permanent method – once the item is deodorized, the odor cannot and will not return.